Oakland University received a A-. U.S. News & World Report's ranking of 228 out of 268 of National Universities High School Counselor Rankings was a major contributor to this grade. Oakland University in the suburbs of Detroit offers a comprehensive, liberal arts, student-centered education to about 18,000 students. The campus is near concert and entertainment venues like the Pontiac Silverdome, Pine Knob, and the Palace of Auborn Hills, and the new Recreation Center on campus includes sun decks and saunas. Describe the type of student who should not attend Oakland University and explain why. What is a typical Oakland University student like? Describe the type of person that should attend Oakland University. Any type of person can be a student at Oakland University. O.U. is very diverse and all are welcome. All that is needed is a passion for learning and the determination to succeed. What are the top 3 reasons someone should attend Oakland University? What was a typical Oakland University student like in high school? Describe the type of person that should attend Oakland University. Oakland University celebrated the 50th anniversary of its founding in 2007. When it opened in 1959, 570 students were enrolled, and the charter class graduated in 1963 with 125 students receiving diplomas. Today, more than 18,000 students attend classes at OU each fall, and our alumni number more than 80,000. Oakland University was created in 1957 when the late Alfred and Matilda Wilson donated $2 million and their 1,500-acre estate to Michigan State University to start a new college in Oakland County. Named Michigan State University - Oakland, the college enrolled its first students in 1959. The name changed to Oakland University in 1963. In 1970, the Michigan Legislature recognized the maturity and stature of Oakland University by granting it autonomy, and Michigan's governor appointed Oakland's first Board of Trustees. With 129 baccalaureate degree programs and 99 graduate degree and certificate programs, Oakland provides a learner-centered education with flexible class schedules and increased facilities, student services, classroom technologies, labs, internships, co-ops and research opportunities with corporate partners. Rated one of the country's 82 doctoral/research universities by the Carnegie Foundation for the Advancement of Teaching, Oakland University offers students opportunities to work directly on research projects with expert faculty who bring current knowledge right to the classroom. Leveraging our location in the heart of Oakland County's Automation Alley, Oakland has forged hundreds of partnerships with hospitals, Fortune 500 companies, cities, government agencies, and educational institutions. As a member of NCAA Division I athletics and the Mid-Continent Conference, Oakland's Golden Grizzlies boast 34 Mid-Continent Conference championships and regular season titles, and 17 NCAA championship appearances. More than half of all student-athletes maintain a GPA over 3.0. In 2009, Oakland University completed its first-ever comprehensive campaign by surpassing its $110 million goal one year ahead of schedule. Gifts from alumni and donors are impacting the lives of OU students and faculty through faculty chairs and professorships, more than 35 research and academic program endowments, dozens of student scholarship endowments, and building and laboratory additions and enhancements. Thousands of new donors were brought to Oakland through the campaign with nearly 2,000 new alumni donors providing support for their alma mater. More than 900 OU employees and retirees contributed to the campaign. What are the top 3 things that students do for fun at Oakland University? The top three things that students do for fun at Oakland University are join clubs, play sports, and participate in on-campus events. Campus housing is available for undergraduates. Housing deposit : $100.00. Housing deposit due : Sep 1. Housing deposit is not refunded if student does not enroll.. Freshman allowed to have car. No pets. Total stated tuition is $10,613, in-state and on-campus, before financial aid. Learn more about financial aid at http://www.oakland.edu/financialaid/. Estimate the net price for you at http://www.oakland.edu/npc. The typical (median) early career salary of Oakland University graduates is $44,100, according to Payscale. Oakland University participates in the NCAA Division I-AAA for college athletics. 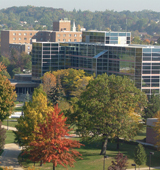 Want more info about Oakland University? Get free advice from education experts and Noodle community members. Do you accept students with a 3.12 GPA and an ACT score of 16? Does it matter if that student has taken mostly AP and ACC classes?